Occasionally, we feature books that might be of interest to far north siders. Here's a great photo history of Rogers Park. Rogers Park bears the name of Philip McGregor Rogers, an intrepid and enterprising Irish immigrant who purchased the first tract of land in the area in the 1830s, a time when it was prairie and woodland, populated by Native Americans and white birch trees. As the federal government forced the Native Americans west, European immigrants arrived in greater numbers, forming a community of woodcutters and farmers. 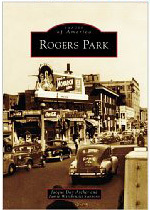 The Great Chicago Fire ushered in an era of economic development, and in 1878, Rogers Park incorporated as a village. In 1893, the town was annexed to Chicago, becoming the city’s northernmost neighborhood along Lake Michigan. During the Roaring Twenties, Howard Street’s grand theaters, jumping nightclubs, and glitzy fashion shops drew adventure seekers by the thousands. The onset of the Depression saw the rise of an art deco skyscraper housing Mundelein College for women. In the coming decades, local movers and shakers made great strides in social justice and racial equality. Today Rogers Park is one of the most ethnically and socially diverse neighborhoods in the country. Jacque Day Archer is a producer, journalist, editor, award-winning writer, and current resident of Rogers Park. She is museum director for the Rogers Park/West Ridge Historical Society. Jamie Wirsbinski Santoro is a social and cultural ethnographer and award-winning writer. She has lived in Rogers Park for more than two decades.